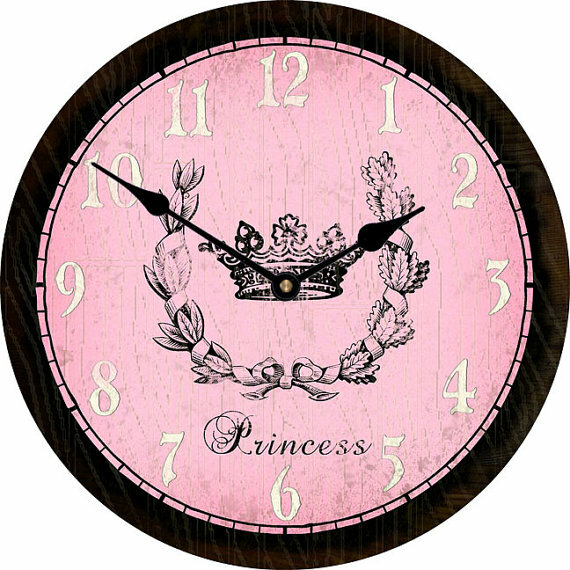 Fit for a princess this French inspired girls princess clock has a slightly distressed fininish and will set off the decor in your childs room. Made in the USA and made when ordered it is available in sizes 12" 18", 24" and 30 inches in diameter using a smooth 1/2" thick wood composite and a quaity Giclee printing process-the clock can be gently cleaned. Runs on a Quartz movement, one AA battery is required, not included. This girls wall clock is made in America and made when ordered, please allow 4-10 full buisness days before shippig.